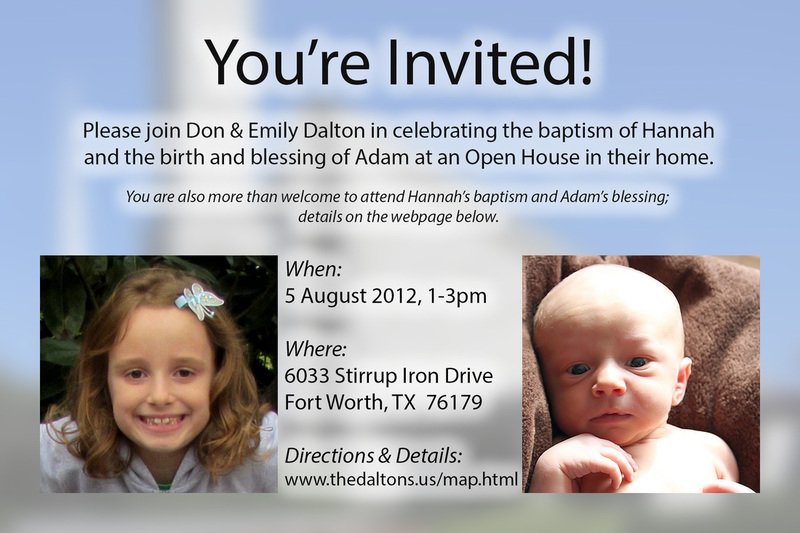 Commemorating the birth and baby blessing of Adam and the 8th birthday and baptism of Hannah, Don and Emily are celebrating with an Open House. RSVP is optional, but appreciated (use the form at the bottom of this page). Preceding the Open House are the blessing and baptism themselves. All are invited to attend them as well, but as many will have their own Sunday morning traditions, all are welcome to just attend the party. The blessing will be a part of our regular Sunday services at the Saginaw Ward building in Saginaw, Texas. The blessing itself will last about 2 minutes of the 1 hour service; if you have never attended an LDS service before, here is something you can read about what to expect. Please also feel free to ask Don or Emily any questions you may have. Hannah will be one of several children baptized at 10am on 8/4 at the Hurst Stake Center. If you have never attended an LDS baptism before, here is something you can read about what to expect. Please also feel free to ask Don or Emily any questions you may have. This form is completely optional, but if you don't mind, it will make organizing the Open House a little easier.